Instead of driving aimlessly looking for a spot, pay a few bucks to have someone give you theirs. It’s happened to all of us: circling for what seems like hours trying to find a parking spot near our house or the restaurant you’re going to. In some dense neighborhoods, it’s a truly epic problem. A study of New York’s Upper West Side found that in one year, residents drove 366,000 miles just looking for parking. 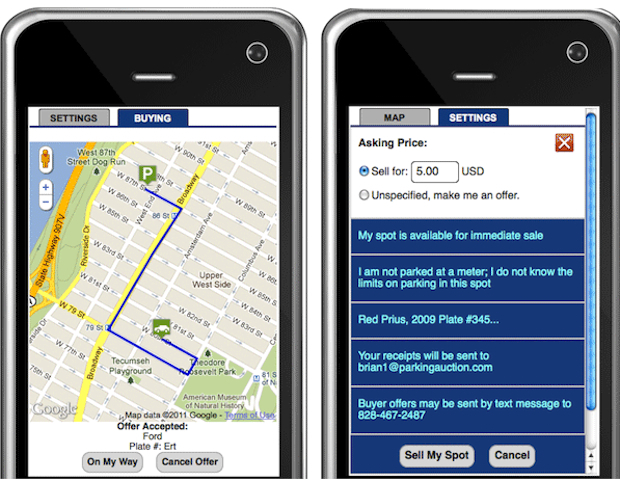 A new web app, ParkingAuction, hopes to fix that problem by letting people who are leaving their spots soon offer them for a price, and for people desperate for a spot to pay a few bucks for information about where, exactly, spots are. By adding market forces to the randomness of daily parking circling, the app could do wonders to do a better job setting the value of the scarce resource of parking spaces. The app–which currently just runs on your phone’s browser, not as a standalone app–allows sellers to broadcast when they plan to leave, or to offer a price that they would be willing to vacate their spot for. “The ideal scenario is: You know you’re leaving in five to 10 minutes,” says founder Brian Rosetti. “You set your price. If anyone bids on your spot, you get a text message.” Once a seller has accepted a bid, you are alerted to each other’s car types, and the seller waits for the buyer to come take the spot from them. Rosetti says that they’re also signing up garages. If a garage has unused spaces, they could set a price lower than their standard rates to help fill them up. There are some major flaws to ParkingAuction, namely, that it’s almost entirely trust and reputation based. It’s up to the seller to determine whether a potential buyer will fit in their spot. “If you’re in a Smart car and the buyer is in a Tahoe, you’re going to reject that bid,” says Rosetti. Also, a buyer doesn’t have to make a payment until he or she is in the spot. An unscrupulous parking seeker could get in a spot and then not pay. Rosetti says that the app’s rating system would prevent this from happening more than once. Right now, you can’t make cash from selling your spots, just credits that you can use to buy other spots. And while the app is available globally, its user base is focused on Rosetti’s home neighborhood on the Upper West Side. But more users will make it exponentially more effective. Cities like San Francisco have been working on plans to price their spots based on popularity. ParkingAuction performs a similar service, reducing congestion and pollution by adding to the cost of parking, and thus making people think less about driving. 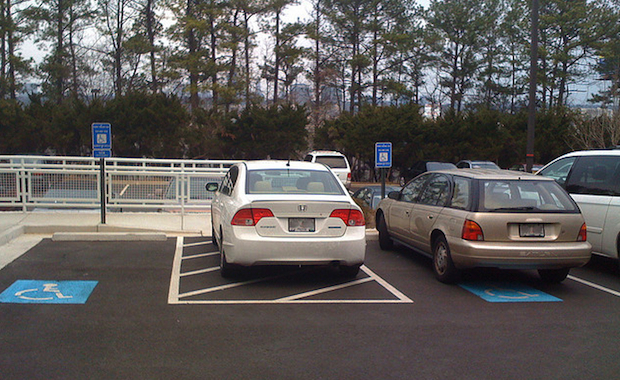 It’s paradoxical, but true: By making spots more expensive, it makes it easier to park.